Good-bye farmers, good-bye broccoli, good-bye green beans. Back in November I wrote a post about the final week of the local farmer’s market: about the gift of free broccoli from my favorite stand, the last green beans of the season, the hand-lettered cardboard sign that said “SUPER TENDER.” You would have kissed your rutabagas and wiped away tears after reading that entry…had I remembered to post it. Oh well. I’m swamped with a personal project this winter, but I wanted to revive this photo to share the recipe for Chinese Restaurant Style Green Beans, from Fine Cooking magazine’s food blog, The Kitchen Sink. The butter browns and adds rich flavor to the beans while the honey thickens into a sweet goo. Think garlic attack, but in a good way. Think sticky chicken wings rich with honey and soy sauce, but with green beans. The chewy, sweet, and salty aspects of this dish satisfy me on their own, but if you insist on other food with your veggies, this would go well with anything from Chinese food to a nice steak and potato. 1) Melt butter with oil in a skillet or saute pan over medium-high heat. Add green beans and a pinch of salt, stir thoroughly to coat. Stir the beans occasionally. Cook until brown and shriveled, about 8 minutes. 3) Reduce heat to low and add the garlic. Cook until another 20 seconds or so until the garlic is fragrant and soft, stirring constantly. Add the soy sauce mixture. Keeping stirring and cooking until most of the water evaporates and the beans are coated with a thick glaze. Remove from heat. 4) Add salt to taste and serve warm. Excellent reheated. This entry was posted in Photos, Recipes, Vegetables by Annie. Bookmark the permalink. Oh my, this sounds amazing. Also thanks for the tip about the blog at Fine Cooking; that was new to me. Of course I immediately added it to my feed reader! Heehee. I am always wiping tears when it comes to Farmers Markets. I just started my first CSA! Box #2 is today!!! 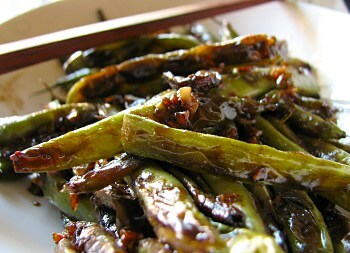 Thanks for the recipe; I love finding new, yet simple recipes for veggies; especially green beans. Kalyn: The blog is especially fun when it gives behind-the-scenes info. janelle: I wish we had a winter’s farmer’s market, but I guess my area is too small to support one. All the snow doesn’t help either. Those beans look exactly like something you’d get in a restaurant! I cannot wait to try this recipe, thanks so much! This does look like a great recipe – I love anything that starts by carmelizing veggies and the sauce looks fab. I’ll definitely be trying this next time I make kung pao chicken…and maybe even sooner! These look really delicious! I make a “twice fried bean” dish that my family love, but this looks like a great change of pace! Rachael: I hope you like it! I’m eagerly looking forward to June when our local markets finally reopen. Charcuterista: It’s a great dish, hope you liked. Deborah: I love twice-fried twice-baked twice-cooked anything. What a beautiful photograph! I might make this with broccolini.